This lease form is designed for a build to suit transaction for a new hospital to be occupied and operated by a doctor group tenant. The premises will include a specified number of parking spaces which may be used during the term of the lease at no charge by the tenant doctor practice group. The document contains a work letter exhibit with extensive provisions concerning construction of premises, including the preparation of improvement plans, tenant improvements, change orders, substantial completion, tenant caused delays, punchlist items and parking lot improvements. After completion of construction, the tenant maintains the entire premises. The landlord has no maintenance obligations except for maintenance associated with a taking or a casualty. THIS HOSPITAL LEASE AGREEMENT is entered as of the __________, 20__ (the "Effective Date"), by and between HOSPITAL PROPERTY LANDLORD, LP, a ________ limited partnership, as Landlord, and HOSPITAL TENANT, LP, a ________ limited partnership, as Tenant. A. As of Commencement Date, Landlord will be the owner of the Land described on Exhibit B attached hereto and made a part hereof for all purposes and is developing on the Land the Improvements (both, as defined herein). Landlord desires to lease to Tenant the Land and Improvements (collectively, the "Leased Premises"). B. Tenant desires to lease from Landlord the entire Leased Premises for the Permitted Use during the Term. C. Landlord and Tenant have agreed to enter into this Lease in order to set forth the provisions of their agreements with respect to the matters covered by this Lease. In consideration of the Recitals and of the representations, warranties, covenants, agreements, waivers, and releases set forth in this Lease, Landlord and Tenant contract and agree as provided in this Lease. 1. Definitions. The definitions of certain of the terms used in this Lease with initial capital letters are set forth in the Glossary of Defined Terms attached as Exhibit A, attached hereto and made a part hereof for all purposes. 2. Demise. Subject to the provisions of this Lease, Landlord hereby leases, demises and lets to Tenant, and Tenant hereby leases from Landlord, the Leased Premises for the Term. Upon completion of the Landlord’s Work, Landlord shall cause Landlord’s architect to prepare an architect’s certificate setting forth the Net Rentable Area of the Building constituting a part of the Leased Premises. 3. Term. The Term of this Lease commences on the Commencement Date and expires at 5:00 p.m. on the fifteenth (15th) anniversary of the Rent Commencement Date (hereafter defined); provided that, if the Rent Commencement Date does not fall on the first day of a calendar month, then the Term will extend until the fifteenth (15th) anniversary of the first day of the calendar month next following the Rent Commencement Date. Tenant shall have the option to extend the lease term for two (2) five (5) year periods upon the terms and conditions set forth in Exhibit E attached hereto and made a part hereof for all purposes. 4. Permitted Use; Continuous Use and Occupancy. Tenant will continuously occupy and use the Leased Premises solely as a rehabilitation hospital for human beings and any and all services related or incidental thereto or other healthcare services as determined by Tenant. 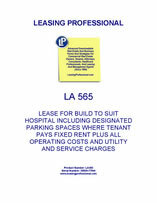 Notwithstanding the foregoing, in the event the law changes to prohibit the use of the Leased Premises as a hospital under Tenant’s current organizational structure or otherwise, the Leased Premises may thereafter be used as a surgery center, imaging center, or other licensed healthcare facility. At Landlord’s sole expense, Landlord shall obtain and deliver to Tenant copies of (a) a written document (the "COO") issued by the City of _________, _________, allowing occupancy of the Leased Premises and the Parking Area (which COO may include, without limitation, a temporary or a permanent certificate of occupancy); and (b) (i) a Statement of Deficiencies and Plan of Corrections and (ii) only if required by any governmental agency for the use and occupancy of the Leased Premises, a Fire Safety Survey Report (collectively, the "Survey Report") issued by the _________ Department of Health, allowing occupancy of the Leased Premises. If the Survey Report includes any deficiencies which are architectural, construction, or structural in nature which are required to be corrected for Tenant’s permanent occupancy of the Leased Premises, Landlord shall correct such deficiencies in a timely manner after Landlord’s receipt of the Survey Report, and Landlord shall use Landlord’s best efforts to obtain a Survey Report which does not include architectural, construction, or structural deficiencies which are required to be corrected for Tenant’s permanent occupancy of the Leased Premises. At Tenant’s sole cost and expense, Tenant shall obtain any and all licenses, permits, consents, and approvals (collectively, the "Tenant Approvals") required for Tenant to conduct its business at the Leased Premises in accordance with the Permitted Use, other than the COO and the Survey Report. Landlord shall reasonably cooperate with Tenant’s obtaining such Tenant Approvals. Notwithstanding any other provisions of this Lease, if the COO contains any requirements for changes to the Building Work, at Landlord’s sole expense, Landlord shall cause such changes to be made in a timely manner and Landlord shall use Landlord’s best efforts to obtain a COO which does not require further changes to the Building Work as quickly as possible. To the extent federal statutes, regulations or other federal requirements limit the physician ownership interest in Tenant’s rehabilitation hospital in the Leased Premises, then Landlord and Tenant will work together to obtain a buyer or a solution that, in either case, is mutually agreeable to Landlord and Tenant for that portion of the ownership interests in Tenant which cannot be owned by physicians, such acquisition being on terms and conditions reasonably satisfactory to Tenant. The rentable area of the Leased Premises may vary from estimate included in this Lease. Once the Leased Premises have been completed, Landlord shall calculate the rentable area of the Leased Premises and deliver to Tenant a written notice (the "Adjustment Notice") of the exact rentable area in square footage of the Leased Premises. Upon execution of the Adjustment Notice, rentable the area of the Leased Premises as set forth in the Adjustment Notice will replace for all purposes the square footage of the Leased Premises otherwise set forth in this Lease and the Base Rent shall be recalculated based upon the rentable area of the Leased Premises as set forth in the Adjustment Notice. 5.2 Base Rent Adjustments: Beginning on the first anniversary of the Rent Commencement Date, and on each anniversary of the Rent Commencement Date thereafter during the Term, the Base Rent then in effect shall be increased by two percent (2%) of the Base Rent in effect immediately preceding such anniversary. 5.3 Additional Rent. For purposes of this Lease, "Additional Rent" for any Fiscal Year (or portion thereof) means the sum of (a) the amount expended by Landlord for Operating Expenses plus (b) all other sums payable by Tenant hereunder, plus (c) sums, if any, payable pursuant to the Work Letter. At or prior to the Commencement Date (for the first Fiscal Year, or portion thereof, during the Term), and thereafter, from time to time during the Term, Landlord shall estimate in good faith the amount of Operating Expenses payable by Tenant for the remainder of the Fiscal Year in which the Commencement Date occurs (for the first Fiscal Year, or portion thereof, during the Term) and for each Fiscal Year thereafter, during the Term. On the Commencement Date, and on the first day of each succeeding calendar month thereafter during the Term, Tenant shall pay to the order of Landlord, an amount equal to: (a) the currently-estimated Operating Expenses payable by Tenant for the remainder of the Fiscal Year in question, (b) divided by the number of whole calendar months remaining until December 1st of such Fiscal Year, so that, by December 1st of each Fiscal year during the Term (including the Fiscal Year in which the Term expires or is otherwise terminated), Tenant shall have paid all of the Operating Expenses for such Fiscal Year, as estimated by Landlord. Within ninety (90) days after the conclusion of each Fiscal Year during the Term (including the Fiscal Year in which the Term expires or is terminated), Landlord shall deliver to Tenant a statement of actual Operating Expenses payable by Tenant for the Fiscal Year (or, with respect to termination or expiration, the portion of the Fiscal Year) just ended. Within thirty (30) days thereafter, Tenant shall pay to Landlord any underpayment in Operating Expenses or Landlord shall credit against the next installment of Base Rent and Operating Expenses payable by Tenant (or Landlord shall refund to Tenant, if the Term has expired and all payments due by Tenant to Landlord have been paid in full) any overpayment in Operating Expenses payable by Tenant for such Fiscal Year. Within ninety (90) days after receipt of such statement, Tenant at Tenant’s expense and after giving thirty (30) days prior written notice to Landlord, shall have the right to review and/or audit Landlord’s books and records relating to Operating Expenses for the immediately preceding Fiscal Year in order to verify Landlord’s annual statement of actual Operating Expenses payable pursuant to this Lease. If any review or audit prepared by or for Tenant reveals an overcharge by Landlord, Tenant shall notify Landlord thereof and shall furnish Landlord with documentation supporting any overcharge and, if Landlord does not dispute the conclusion in such review or audit, Landlord shall promptly reimburse Tenant for such overcharge. Notwithstanding the preceding sentence, however, if Landlord disagrees with Tenant’s position, then either Party may submit the dispute to arbitration in accordance with the rules of the American Arbitration Association relating to expedited arbitration. The determination arising out of such arbitration shall be final, binding, and conclusive on the Parties with respect to Operating Expenses for the Fiscal Year in question. Landlord agrees to pay Tenant’s reasonable review or audit costs if Tenant’s review or audit, whether accepted by Landlord or verified by arbitration, reflects an overcharge by Landlord of more than five percent (5%) with respect to any Fiscal Year. If Tenant fails to request an audit of Operating Expenses for any Fiscal Year within the ninety (90) day period provided, then Tenant shall be deemed to have irrevocably waived the right to audit the Operating Expenses for such Fiscal Year. (a) The Complex will include a total of ______ (___) parking spaces, plus two (2) loading spaces (the "Spaces"), which number of Spaces at least complies with the minimum parking requirements of the City of _________, _________. Tenant may restrict entry to a portion of the Spaces, to be designated by Tenant (the "Exclusive Spaces"), through the use of limited access gates, or by other means. Such restriction on access may be included as a part of the initial Improvements. If Tenant restricts entry to the Exclusive Spaces after the construction of the Improvements, then Tenant shall pay the cost of directing the means by which such access is limited. Further, Tenant shall be responsible for the cost of maintenance of the means by which such limited access is achieved. Except for the Exclusive Spaces, Tenant’s physicians, employees, patients, invitees, and guests may be required to park in designated parking areas on a non-discriminatory, unreserved basis. The Parking Area will be depicted and provided for in the Construction Documents. Landlord shall not make any modification to the Parking Area without the express prior written consent of Tenant, which consent may be withheld in Tenant’s sole discretion. (b) Throughout the Term of this Lease, Tenant shall pay no parking charges for Tenant’s use of the Spaces, including without limitation the Exclusive Spaces. Tenant may establish fees for parking in various portions of the Parking Area; provided that, Tenant shall be solely responsible for implementing and managing any arrangement for limiting access to any portion of the Parking Area and the collection of any fees. 5.5 Payment of Rent. Tenant promises and agrees to pay to the order of Landlord all Rent, including, without limitation, Base Rent and Additional Rent, as provided herein. Except as otherwise expressly provided in this Lease, all Rent is due and payable in advance monthly installments on the first day of each calendar month during the Term. Rent shall be paid to Landlord or to such other person or at such other address as Landlord may from time to time designate in writing. Rent shall be paid without notice, demand, abatement, deduction, or offset in legal tender of the United States of America. If the Term commences or ends on a day other than the first or the last day of a calendar month, the Rent for the partial month shall be prorated on the basis of the number of days during the month for which the Term was in effect. If the Term commences or ends on a day other than the first or the last day of a Fiscal Year, the Additional Rent for the partial Fiscal Year shall be prorated on the basis of the number of days during the Fiscal Year for which the Term was in effect. 5.6 Delinquent Payments and Handling Charge. In the event any installment of Rent is not paid when due, a late charge in the amount of three percent (3%) of the delinquent sum shall be due and payable. Further, all Rent and other payments required of Tenant hereunder shall bear interest from fifteen (15) days after the date due therefor until the date paid at the rate of interest specified in Section 25.12. 5.7 Guaranty. Contemporaneously herewith, the Tenant Principals are executing and delivering the lease Guaranty in the form of Exhibit F attached hereto and made a part hereof for all purposes.